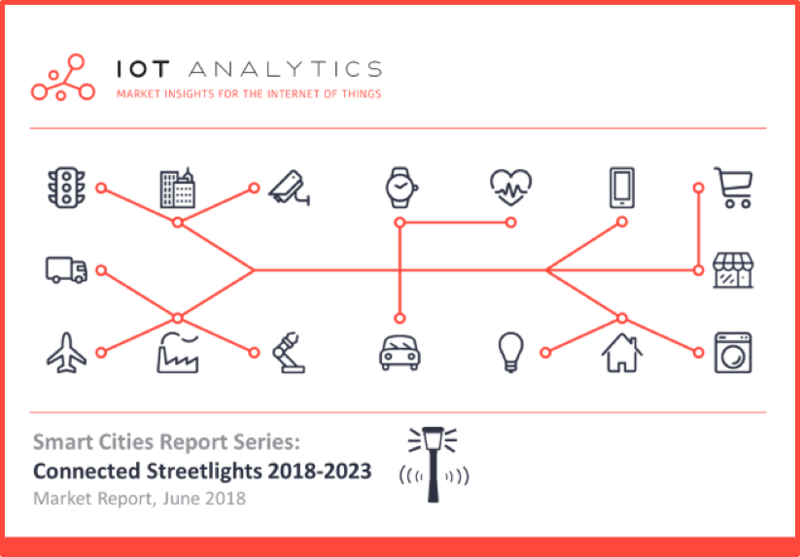 IoT Analytics forecasts Connected Streetlights Market Revenues To Reach $3.6B by 2023. In 2016, the governing body in Los Angeles, United States, embarked on a connected streetlight project. Through the installation of 110,000 units, the city managed to reduce annual costs by over US$9M in terms of energy savings resulting from 63% reduced energy consumption annually. In addition, the city also managed to reduce annual maintenance costs by over US$ 3M. Overall CO2 emission reduced by 61,000 tonnes, thanks to the initiative. 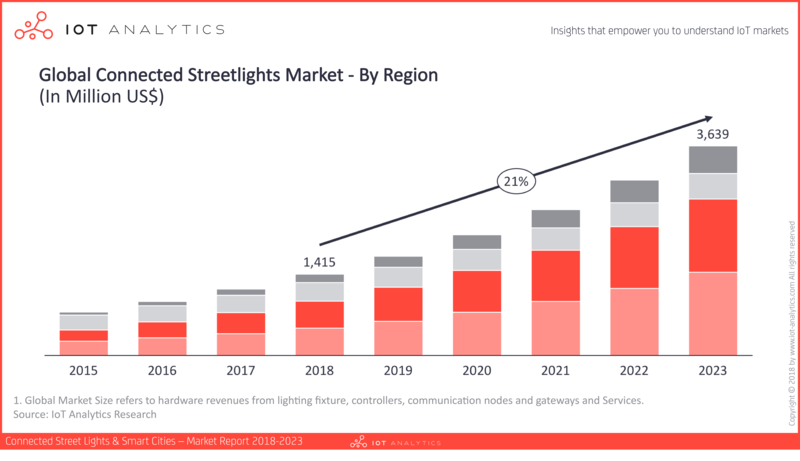 In addition to a comprehensive view of the streetlights market, the technology and various ongoing and completed projects, the report also looks at the competitive landscape of streetlight vendors, including key benefits, drivers, barriers and considerations influencing the deployment of connected streetlights. Telensa and Itron (formerly Silver Spring Networks) are ranked as the market leaders in terms of penetration in the global installed base. “One of the new trends in streetlights is the use of remote diagnostics and machine learning that enable municipalities to reduce maintenance costs and optimize overall infrastructure uptime.” says Raquel Artes, Senior Analyst at IoT Analytics and main author of the report. Interestingly, Asia Pacific (APAC) is emerging as the leading adopter of Connected Streetlights. India, China, and Australia are forecasted to have the highest number of deployments in the region. Besides sizing the streetlights market across regions (North America, Europe, Asia Pacific and Rest of the World), the report examines Connected Streetlight initiatives of municipalities across the world – as such, deployments of Connected Streetlights in 86 cities around the globe have been ranked – some are profiled in depth as case studies. Small and medium sized cities seem to be as innovative as some larger cities. The City of Providence, Rhode Island with 16,000 deployed connected streetlights, for example, ranks #1 in the deployment of connected Streetlights for small cities in North America. Furthermore, the publication discusses disruptive trends that stakeholders need to watch out for in the Connected Streetlights space and discusses which connectivity technologies will gain traction in the streetlights market in the next 5 years. The Connected Streetlights Market Report is part of a larger effort of mapping Smart City efforts such as smart mobility, smart parking, smart waste management, citizen engagement, and others. The Market Report is available for purchase HERE. A sample can be requested HERE. IoT Analytics is the leading provider of market insights & competitive intelligence for the Internet of Things (IoT), M2M, and Industry 4.0. The boutique research firm helps more than 40,000 Internet of Things decision-makers understand IoT markets every month. IoT Analytics tracks important data around the IoT ecosystem such as market developments, M&A activity, startup funding, company projects, use cases and latest news. Product offerings include in-depth market reports as well as bespoke research and consulting services. As a research pioneer, IoT Analytics combines traditional methods of market research such as interviews and surveys with state-of-the art web-mining tools to generate high-calibre insights. SilverSpring Networks (Itron), Signify (formerly Philips Lighting), Telensa, Echelon, Huawei, Nokia, Ericsson, Current Powered by GE, Microsoft, Cisco, IBM, Vodafone, Smart City Bhopal, Bharti Infratel Limited, Wireless Broadband Alliance, Ajuntament de Barcelona, Schneider Electric, Chordant, PTC. The post Connected Streetlights Market: APAC to emerge as the leading adopter appeared first on IoT Analytics.